When you're trying to decide on the right wheels and tires for your golf cart, one of the first things you need to do is decide if you want a lift kit or not. Make a solid investment in a lift kit combo for wheels and tires. Jake's Models are the standard in the industry in both quality and durability. They are also made in the USA! Once you have made the decision to purchase a lift kit, you can choose from a 3, 4, 5, 6, 7, 8, 10, or long travel lift kit. The long travel lift kit can be adjusted in most cases in terms of height so you can adapt to the terrain. The top of the line in lift kit options is the Jake's LT lift kit, which has a brush guard, a fully adjustable camber, and a 2-receiver hitch built-in. This kit replaces the factory front end and gives you a true independent front wheel suspension. This makes for a smooth ride over the very roughest of terrain. This actually serves to turn your golf cart into an ATV! Standard lift kits will leave you with a decision as to the height you want. 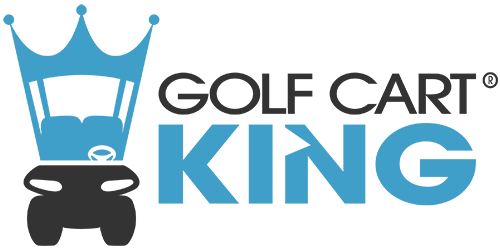 You may have questions, and Golf Cart King has all the answers. Some advice for standard lift kits: If you go with a 3-inch left lift kit, you will need to stay under a 22-inch tire. To be completely safe at all times, you should probably go with a 4-inch lift kit for 22-inch tires. Tire clearance depends on the golf cart model and type, but do be aware that anything above 22 inches on a 3-inch lift kit is in jeopardy of rubbing against fender wells. 5-inch left kits can accommodate 23-inch tires, 6-inch lift kits can accommodate 24-inch tires, and so on. If you are not sure what tires you need, do not hesitate to call Golf Cart King. We are more than happy to work with you to help you find the correct wheels, tires, and lift kit for your golf cart before you order. Aside from lift kit sizes, there are three basic types of lift kits you can purchase for your golf cart. There are A-arm lift kits, spindle lift kits, and drop axle lift kits. Many people prefer the A-arm lift kit because it provides for true independent front wheel suspension, which lengthens the wheelbase and should have a fully adjustable camber. The spindle lift kit is the easiest of the three to install. It is functional and cost effective, and it basically replaces the front spindles with ones that drop further down. This is what gives your golf cart a lift. If you have an accident, this is also the easiest of the three to fix. The third option is the drop axle lift kit. This lift kit is more difficult to install, as this basically involves replacing your front axle. This is the choice for those looking to strengthen their golf cart as well as lift it. We have the expertise to help you make the right decision, so feel free to contact us and let us help you.